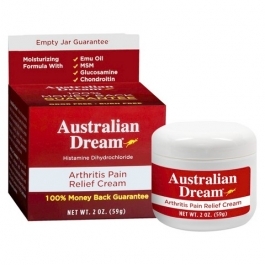 Australian Dream® Arthritis Pain Relief Cream effectively relieves minor arthritis pain, simple backache, strains, sprains and bruises without the unpleasant qualities of many other pain relievers. It causes no painful burning sensation, has no odor and does not leave a greasy feeling behind. All you feel is soothing relief. For powerful topical pain relief, Australian Dream® uses histamine dihydrochloride. This active ingredient increases blood flow to the treated area, relieving arthritis pain the way your body does naturally. Australian Dream® is the ideal product to help treat your minor arthritis muscle and joint pain. For use by adults only. Apply to affected area no more than 3 to 4 times daily. Store between 40°F and 86°F (4°C and 30°C). *What is the Empty Jar Guarantee? If you are not completely delighted with your purchase of Australian Dream®, you can return the empty jar for a full refund. It's that simple. How do I return the product if I am not satisfied? * Limit one refund per household. If you have any further questions, call us toll free at (888) 600-4642, Monday–Friday, 9am–5pm.